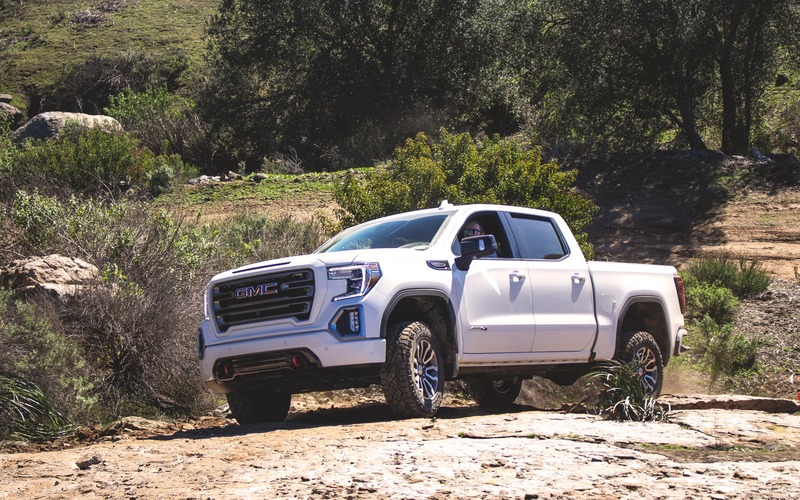 SAN DIEGO (California) – Let’s be honest here, the 2019 GMC Sierra AT4 is not a direct competitor to the Ford F-150 Raptor. And the day Ram introduces its Rebel TRX pickup, it’ll apparently be powered by a Hellcat engine, which means it’ll be even meaner. But that doesn’t prevent this GMC from being a superb adventure machine. On the contrary, it’s equipped just well enough to escape an apocalyptic landscape. We were in California, just outside of San Diego, to test out its off-road capabilities. 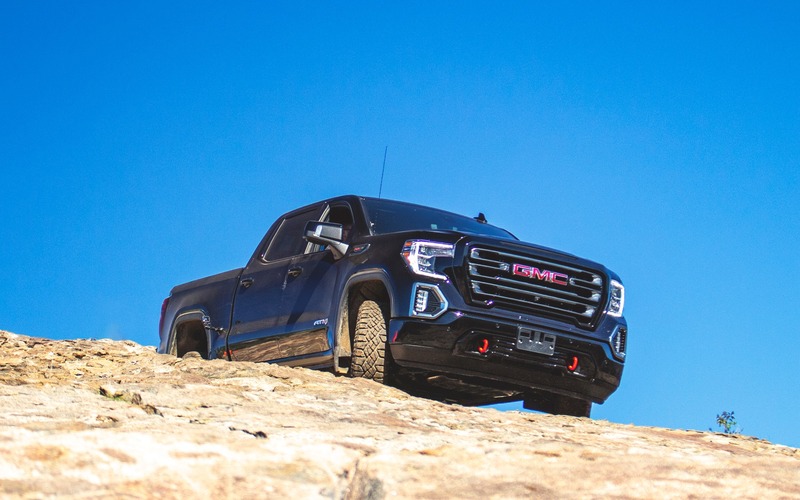 The AT4 is the all-new GMC Sierra 1500’s off-road trim package. It kicks off at $61,500 and adds to an already capable truck just the right amount of gear to tackle rough terrain. The AT4 trim will also be offered on the recently unveiled Sierra Heavy Duty model. Modifications over the standard Sierra include new Rancho suspension dampers, a 51-mm lift, skid plates front and rear, an Eaton rear locking differential, a hill decent control and 33-inch off-road tires, either for mud, or all-terrain. It’s to your liking. Visually, all AT4s come standard with a blacked-out grille, trim-specific wheels and red tow hooks; handy for when you need to pull a friend out of trouble. 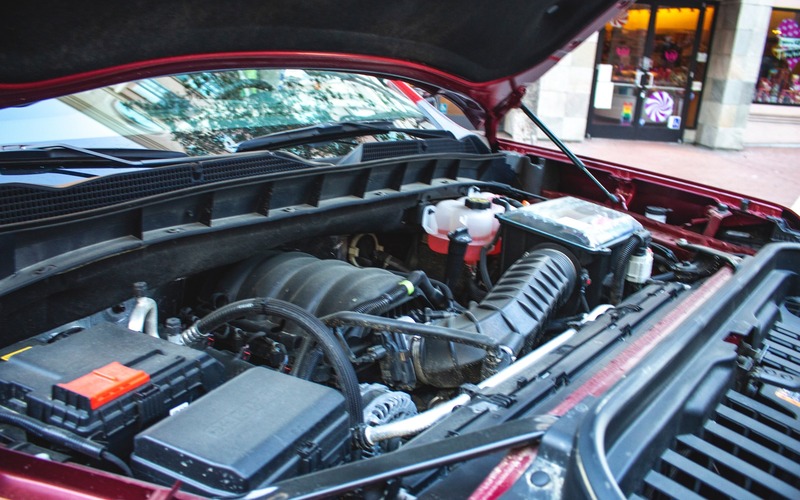 Engines and transmissions are carried over from a standard 1500, which means the AT4 can be powered by a choice of two V8 engines; a 5.3-litre good for 355 horsepower and 383 lb.-ft. of torque, and a 6.2-litre that pumps out 420 horsepower and 480 lb.-ft. A turbo-diesel 3.0-litre straight-six is also available. If all of this isn’t enough for you, GMC will sell you an Off-road Performance package. Available with the 6.2-litre V8, this option slightly bumps horsepower to 435 hp and torque to 489 lb.-ft., as well as slightly modifying the air intake and exhaust system to give the truck a few more decibels. And trust us when we say this, the Sierra AT4 doesn’t only look badass, it sounds badass! GMC had prepared us an interesting, but rather smooth drive route. We were essentially asked to climb a mountain, following each other in a convoy, to then descend it on its side, not forgetting the series of ravines and breathtaking views to our left. To be honest, this was light-grade off-roading. We’re convinced these trucks can take a lot more abuse. However, the experience did allow us to sample the new Rancho suspension setup, which proved compliant both and off the road, leaving the Sierra’s smooth operation characteristics that we adore so much intact. We’ll even say the setup works better than the stock units. Meanwhile, the cabin remained as quiet as a monastery. The second part of the trail was a little more challenging. We were ordered to climb a steep rock head first, differentials locked in 4x4 low, to then re-descend it using the truck’s hill decent control. While the soothing exhaust note of the burbling V8 reassured journalists as they sat there inclined at 45 degrees, our trucks never broke a sweat, their tires not showing a hint of slip on the sometimes slippery surface. But of course, this isn’t very surprising. Such programs are put together by the carmaker itself in controlled environments. They rarely paint the full portrait about what the vehicle can or cannot do out in the wild. But hey, to GMC’s credit, we’ll admit the Sierra AT4 remains an intriguing package. It offers consumers far more than a simple aesthetic redo. Equipped this way, the Sierra has enough skills to take on the rough stuff without too much worry, all while keeping the adorable attributes of comfort and practicality you’d expect from this class of trucks. Essentially, the AT4 is a fantastic starter pack for anyone seeking to build the ultimate adventure war machine. 5/10	We recorded an average of 15.2 L/100 km with the 6.2-litre V8. That's good, but the numbers aren't lower than with its predecessor. 8/10	A spacious cabin that offers plenty of leg- and headroom for rear passengers. 8/10	The 6.2-litre V8 is smooth and pulls strong, but the 5.3-litre feels weak and unrefined. 10/10	Simple, easy to grasp and intuitive. Incorporates interesting towing features. Android Auto / Apple CarPlay integration. 8/10	This truck surpassed our handling expectations for a body-on-frame configuration with a rear leaf-spring suspension setup. 9/10	Just as technical as its cousin, the GMC Sierra manages to distinguish itself thanks to a compelling Denali trim, and smart, innovative bed and tailgate.